Home Music Atif Aslam’s #1 Fan Refused to Let Go of Him! Atif Aslam is a gentleman — through and through. The Pakistani singing sensation has proved that many times. It’s not common for him to meet fans who are ready to hug, cry and touch him but it does get a tad bit awkward when all of it happens in front of a massive crowd — during a concert. 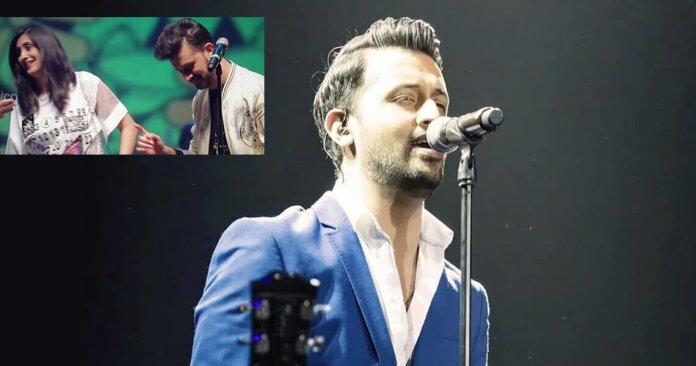 Atif Aslam had to face this situation when, at a recent concert in Dubai, an avid fan decided to NOT let go of the singer. The pretty girl came to the stage with an ‘I Love You Atif‘ postcard and just couldn’t handle a dream come true moment. As seen in the video below, she kept taking pictures in different poses (LOL, girls will be girls) while Atif kept obliging her requests. This isn’t the first time that Atif Aslam was swamped by an eager fan. Back in 2012, while he was filming for Sur Kshetra in India, a girl jumped on the stage and literally started hugging and kissing him! TBH, we don’t blame the fans. We’d probably do the same thing if (fingers crossed) we ever get the chance to meet the man behind SO many romantic hits of our time. Next articleMahira Khan Has A Best Friend in Bollywood Nobody Knew About!